The Who's classic rock opera 'Tommy' has been recorded in various incarnations. Originally, of course, there was the album, released by the band in 1969. Then, a movie, musical and various concert incarnations saw the light of day. This single is a track from 'Tommy', as performed by Roger Daltrey with the London Symphony Orchestra and the English Chamber Choir. It was taken from the soundtrack of the movie 'Tommy'. The single reached number 13 in the UK singles chart in the summer of 1973. 'McVicar' is a British film, released in 1980, starring Roger Daltrey from The Who in the title role of John McVicar, an armed robber turned writer who Scotland Yard publicly announced to be Public Enemy Number One and wanted dead or alive. 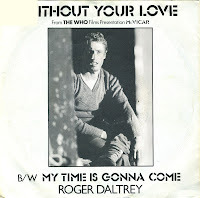 The soundtrack of the film was performed entirely by Daltrey, and the single 'Without your love' was drawn from the soundtrack album. 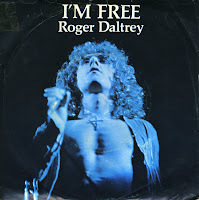 Though it was only a minor hit in the UK (peaking at number 55 in the singles chart), it reached number 3 in the Dutch Top 40 and it remains Daltrey's only top three hit in this country.